The average cost of assisted living in Palm Coast is $3,072 per month. This is lower than the national median of $3,346. Cheaper nearby regions include Saint Augustine with an average starting cost of $2,937. To help you with your search, browse the 46 reviews below for assisted living facilities in Palm Coast. On average, consumers rate assisted living in Palm Coast 4.2 out of 5 stars. Better rated regions include Palatka with an average rating of 4.6 out of 5 stars. Caring.com has helped 7 families in Palm Coast find high-quality senior care. To speak with one of our Family Advisors about assisted living options and costs in Palm Coast, call (855) 863-8283. Palm Coast is located in Flagler County on the east coast of Florida, north of Ormond Beach and Daytona Beach. Seniors in this community have 23 aassisted living facilities (ALFs) in the Palm Coast area to choose from, with 18 directly within the city limits and five nearby. ALFs in Palm Coast, as in all of Florida, are regulated by the Department of Elder Affairs and fall in four distinct categories: standard, which includes housing, meals and personal care; limited nursing services, which includes 24-hour nurse supervision; extended congregate care, which allows residents to age in place in a residential environment despite mental or physical limitations; and limited mental health care, which includes care for those suffering from mental disorders . The Bureau of Health Facility Regulation oversees facility licensing of all ALFs in Florida. With lows hardly dropping below 45 degrees, Palm Coast averages between 70 and 90 degrees throughout the year. Because Palm Coast never gets snow, this area is an excellent option for seniors looking to escape harsh winters. Air quality in Palm Coast is better than the national average of 58, with a ranking of 68 based on measures of hazardous air pollutants. This can be an important factor in determining ALF location. Palm Coast offers activities specifically designed to meet the needs of senior citizens at the recently opened Senior Social Corner. With events happening Tuesdays and Thursday mornings, the Senior Social Corner provides seniors with an opportunity to meet new people. The cost of living in Palm Coast is approximately 2 percent below the national average and 3 percent below the Florida average, making it a cheaper choice for seniors. Crime rates are higher in Palm Coast than the national average, with violent crime ranked at 43 (national rate of 31.1) and property crime ranked at 45 (national rate of 38.1), potentially making this area slightly more dangerous for seniors to reside in. The Palm Coast area is home to world-class medical facilities, including Florida Hospital Flagler Park, in the event of medical emergencies or illness. Assisted Living costs in Palm Coast start around $3,072 per month on average, while the nationwide average cost of assisted living is $4,000 per month, according to the latest figures from Genworth’s Cost of Care Survey. It’s important to note that assisted living rates in Palm Coast and the surrounding suburbs can vary widely based on factors such as location, the level of care needed, apartment size and the types of amenities offered at each community. 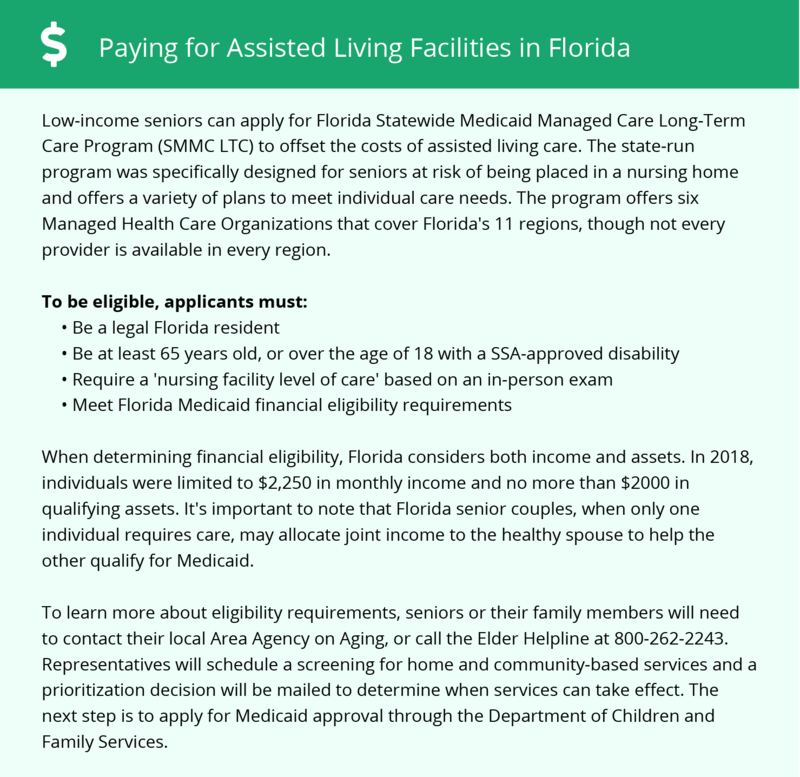 Eligible seniors can receive financial assistance from the Florida Statewide Medicaid Managed Care Long-Term Care Program (SMMC LTC). Additionally, the state of Florida pays for services in ALFs with a standard or specialty license under a statewide 1915(b)(c) MLTC program. Waiver participants must be offered a private room, private apartment or unit that is shared only by consent. To see a list of free assisted living resources in Palm Coast, please visit our Assisted Living in Florida page. Palm Coast-area assisted living communities must adhere to the comprehensive set of state laws and regulations that all assisted living communities in Florida are required to follow. Visit our Assisted Living in Florida page for more information about these laws.